AVGVSTVS [AVGVSTVS]; head r. with rosette-diadem. 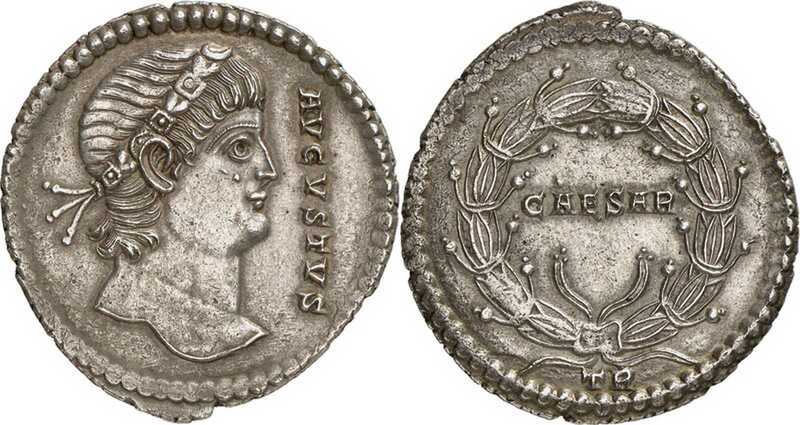 CAESAR in laurel wreath. TR in exergue. UNLISTED ISSUE. Minted in 336. Similar to LYONS 283 (p. 141), ARLES 410 (p. 278), SISCIA 259 (p. 459), THESSALONICA 221 (p. 529), CONSTANTINOPLE 132 (p. 588) and NICOMEDIA 197 (p. 634). Coin should be listed after TRIER 570. AR medallion of 4 heavy siliquae. Weight 14.10 g. Sold on Numismatik Lanz auction 26 (lot 907) in December 1983 for DM 105,000; sold on Numismatica Ars Classica auction 15 (lot 486) in May 1999 for CHF 38,000; sold on Numismatica Genevensis SA Auction 5 (lot 296) in December 2008 for CHF 70,000. Note, hovever, that authenticity of this coin is under suspicion and it could be a modern forgery.